Behind Chen Zhifeng’s hotel and gallery in northern Ürümchi are giant Jurassic Park-style gates often guarded by a huge hound (which I’m told is Chen’s personal pet). 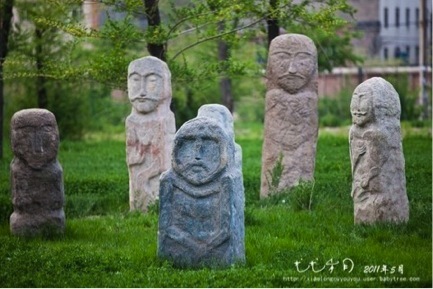 Inside the gates is something Chen refers to as an “Ancient Ecology” park: a collection of rare Xinjiang artifacts. There is a forest of petrified wood, a collection of meteorites, sand-polished boulders, mysterious stone balls, and a collection of ancient Turk ancestor stelae known as balbals. It is here, among propped-up 3,000-year-old desert poplars (the iconic symbol of Xinjiang), that Chen meets visiting heads of state and domestic dignitaries for business negotiations and history lessons in Xinjiang style. In the northeast corner of the park Chen has a motley crew of camels, eagles, peacocks, deer, and cows – but most impressively, a small herd of 38 wild horses from which his brand gets its name. These horses, known as the horse “discovered” by the famous Russian explorer Nikolay Przhevalsky, or as the horse of the Jungar Mongols, are native to the steppes of Northern Xinjiang. Przhevalsky and the Jungars did not survive the reign of the Qing. Przhevalsky died from bad water near present-day Karakul on the Kyrgyz side of the Heavenly Mountains; and the Jungars fell to the Manchu armies and were driven into the mountains (see P. Perdue’s fantastic tome). But the horses are still with us, and Chen Zhifeng is determined that they stay that way. 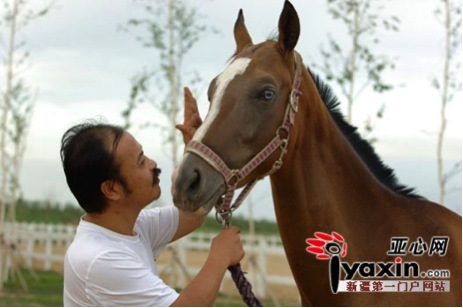 It was around 2009 that Chen took up horse breeding as a profession. For love of horses and country he set out to bring the “Heavenly Horses” discussed by the great Han Dynasty historian Sima Qian back to China. These horses, sometimes referred to as fierce “blood-sweating” horses (hànxuèmǎ) in the Shiji and other ancient texts, are what he refers to as the “Rolls-Royce of horses.” The blood-sweating may have come either from parasites or thin skin, but regardless of the veracity of this legendary attribute, the physical prowess of these sleek horses is undeniable. According to researchers at the University of Kentucky, they are the oldest known breed of domesticated horses. Today there are around 3,000 of these horses, referred to as Fergana Horses after the famous valley that straddles the border between Kyrgyzstan and Uzbekistan. According to the reporter Lu Shuhua, the price for these horses can vary between $325,000 and $49 million (!). 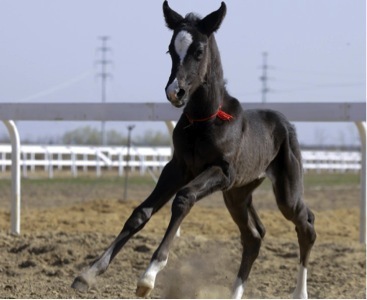 By April 2012 Chen had successfully bred the first Chinese-born Fergana horse, bringing his total number of Fergana horses on his ranch in Northern Xinjiang to 17. Chen is not alone in buying this historically-charged breed of horses. In 2010 China Daily pointed out that the billionaire Zhang Zihan and horse industry leader Qu Qingdong had also bought blood-sweating horses from Turkmenistan in 2007 for around $1 million dollars apiece. But it does seem like he is leading the charge of claiming these horses as the premier horse of China and Xinjiang as their home stomping ground. In February of 2013, Chen announced further plans to develop a tourism and culture industry park that would present Xinjiang as the nexus of “four major civilizations.” With the help of Chen’s energy and deep pockets, we can be assured that Xinjiang style is on the ascendance. Follow this link for a nice photo-essay from Chen’s Ancient Ecology Park. I’ve heard of these blood-sweating horses before, pretty awesome that they’re still around. I would have assumed that they were extinct already.